Just as the sign reads, Breakfast on the Bernard at 2J's Cafe was a place to "sit, relax and gossip". 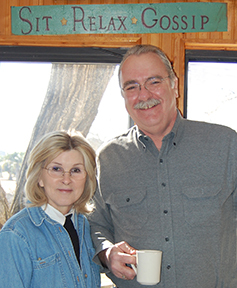 Marie Breakiron and George Zwicker enjoy a cuppa joe. "Fantastic !!! It sure was a beautiful day. I will send our guys out to pick up the bags. Thanks for all your group's hard work." –Carol Davis, Director TxDOT Motor Carrier Division, upon learning of F.O.R. 's trash pickup effort. 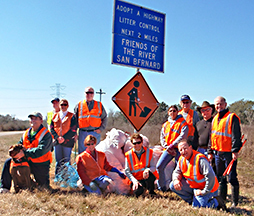 Twenty-one bags of trash was collected in an hour and a half by this clean-up crew, l. to r., mascot Hershey, Nick Fratila, Karyn Kadera, Suzanne Goodson, George Zwicker, Ana Pogue, Susan Bailey, Colleen Roco, Al Roco, Ed Kadera, Mike Goodson and Ken Wright. Absent from the photo is Nancy Kanter and Marilyn Shockley.